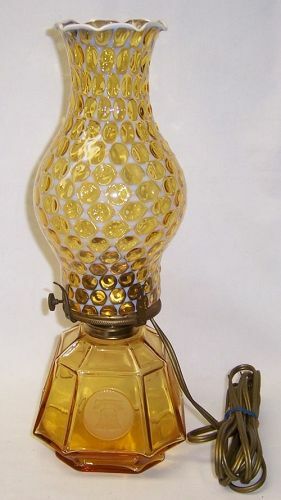 This is a really great depression era Amber Coin Electric Coach Lamp made by Fostoria Glass. The Lamp works. It measures 13 1/2 inches high to top of Globe when together. The Lamp base measures 4 3/4 inches in diameter. The metal parts are all very good. The wiring is good. Both the Lamp base and Globe are in very good condition with no chips or cracks. We guarantee items to be as described. THANK YOU.